Cyborg alerts Regime Superman that all of the escapees should be incarcerated by year's end, but that a resistance group in Gotham, the Joker Underground, is growing. Regime orders Cyborg to find them. The Joker Underground holds a secret rally to begin mobilizing, but are interrupted by Batwoman, who decries them meeting in the name of the Joker, a homicidal maniac responsible for the oppression they now rail against. Batwoman outs Harley Quinn and states she's there to take Harley, but the Underground turns their weapons on her, refusing to allow it. Story - 2: The idea of oppressed people meeting in the name of a maniac is reflected throughout human history, and it's actually a good stroke of writing in Injustice which, of course, cannot hope to last. Batwoman's heady words are also very much appreciated, as the Joker is the one who set Regime Superman on this path, but the blindness to Harley Quinn cannot be anything but exasperating. Harley Quinn was there for all of it. The killing of Jimmy Olsen, the abudction of Lois Lane... She assisted the Joker in every aspect of the heinous act that caused the Injustice storyline, and has not had to pay for it at all. 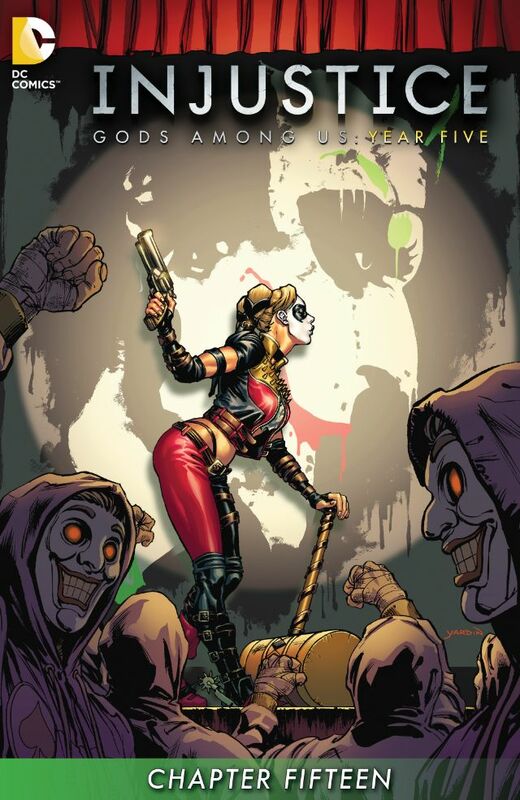 The Batman has turned an absent conscience to Harley Quinn, and readers could care less, so long as the enjoyment is there, but you would think that having been party to the greatest crime in the series, Harley Quinn should be public enemy number one, but such is popularity... and Injustice. Art - 4: A serviceable issue.